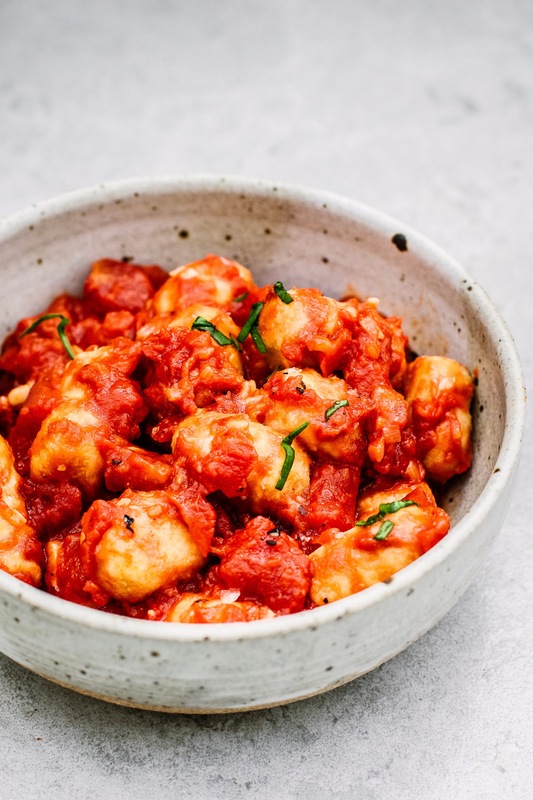 This chickpea gnocchi is so delicious and actually really easy- don’t be thrown off by the long instructions. It’s no secret that I love my chickpeas and this is such a warming, comforting way to have them. 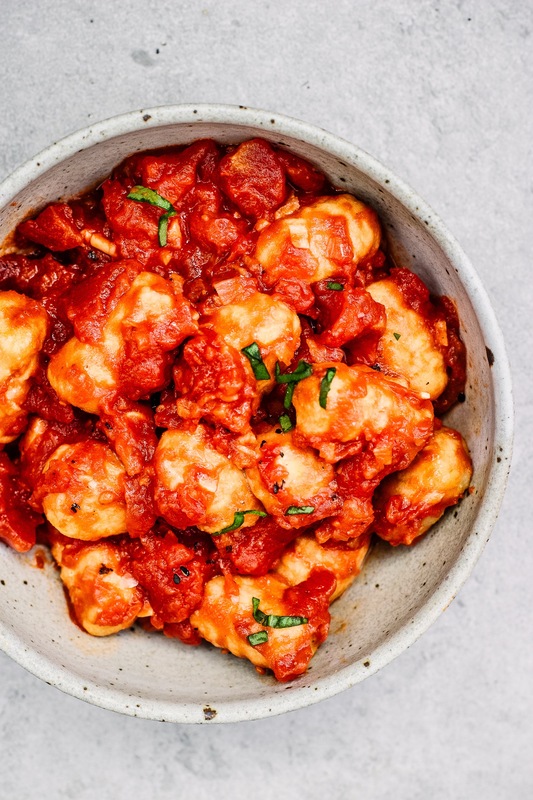 The tomato sauce is one you can use with anything and and it’s so simple you’ll be able to make it from memory after the first time. Add the olive oil to a large pan on medium low heat. Add the minced onion and cook for about 5 minutes, stirring often, until soft and sweet. Add in the garlic and cook for another 2 minutes. While the onions and garlic are cooking, drain and rinse the chickpeas. Then remove their skins. The best way to do this is to add them to a large mixing bowl in the sink. Fill with cold water and vigorously rub them together under the water. Pour off most the water, the skins should float to the top and pour out while the chickpeas stay at the bottom. Fill up the bowl again and repeat 3 or 4 times until almost all of the skins are gone, then drain the chickpeas through a colander. Add the the chopped tomatoes to the pan and stir well. Season with sea salt and pepper and stir. Bring it to a gentle simmer and let it simmer and thicken for about 20 minutes, then stir in the chopped basil. While the sauce is simmering, blend the chickpeas in a food processor with a pinch of sea salt until smooth, then transfer to a bowl. Add the water and the flour and knead the mixture with your hands until you have a ball of pillowy dough. It should be a little sticky but easy to handle, add a little more water or flour as needed. Get your water boiling. Flour a clean surface and use your hands to roll the dough into cigar shapes. Then cut the cigars into 3/4 inch pieces, don’t make them too big- this recipe works better if they are a little smaller than regular gnocchi. Use your hands to round each one, then roll a fork over each piece to mark them. Add the gnocchi to the pot in two batches. Cooking them until they bounce to the top, about 2-3 minutes. then lift them out and add them to the pan with the sauce. Stir through the sauce and serve. This looks great! Is there any way this could be made ahead of time, or would it need to be eaten straight away? Looks delicious!! We really love your recipes. Do you think any other flour would work? Plain gluten free?